Gujarat Mahila Vikas Puraskar 2011-12 and a cash prize of Rs.1.00 lack awarded by the then chief Minister of Gujarat State, Shri Narendrabhai Modi, in appreciation of Supath’s contribution towards women empowerment in the state of Gujarat. 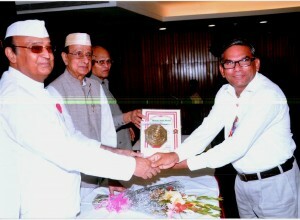 Shri D.S.Sutaria has been awarded “Bharat Jyoti Award” by Hon’ble Dr. Bhishm Narayan Singh, fomer Governor of Tamil nadu and Assam, in 2011-12, for Supath’s outstanding services and contribution for socio-economic empower-ment of poor women. 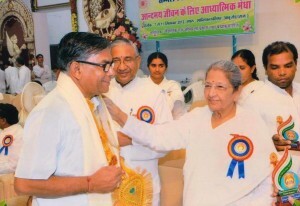 He being a senior member of Scientist and Engineering Wing (SEW) of Rajyoga Research and education Foundation, Mount Abu has been falicitated in the conference on Spiritual Wisdom for Life blissful held from 7th to 11th September 2012 by Hon’ble B.K.Sarladidi, (Gujarat Zone in charge) and B.K.Mohan Shingal, (National Co-ordinator, Scientist and Engineering wing and academy for a better world). The main objective of Supath was to extend holistic support to poor to better their lives by economic and social empowerment through constructive interventions addressing grass root level issues. Vision : “To build a healthy, happy, peaceful and prosperous society“ Mission : “To develop mental, intellectual and emotional capabilities to imbibe values and virtues in one’s life to re-establish healthy, happy, peaceful and prosperous society”.